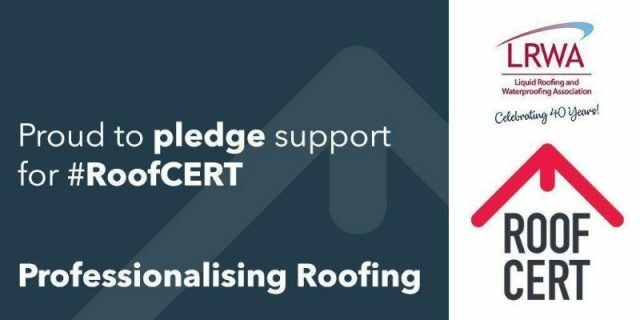 The LRWA is officially pledging its support for RoofCert which is a National Federation of Roofing Contractors (NFRC) initiative, comprising of a new accreditation programme jointly funded with Construction Industry Training Board (CITB). The initiative aims to establish an industry-recognised ​accreditation standard for a roofing installer, supported and ​recognised by the construction supply chain and consumers. RoofCert will include online technical competency tests for nine roofing disciplines. The first to be launched is the test for slating and tiling, which consists of 35 multiple choice questions. The LRWA is leading the development of a technical competency test for liquid roofing, based on the latest standards and best practice. It is anticipated that this will be unveiled in September 2019. Following a pilot period over the coming months, the technical competency test will be carried out at test centres across the UK and will become the lynchpin of the RoofCERT National Roofing Accreditation. It will be open to roofing installers in all disciplines with or without vocational qualifications.